Mi Museo, Granada Collection, is a private collection of Nicaraguan Pre-Columbian ceramic that is open to the national public at no charge, with foreign visitors paying entry collaborate with the maintenance of the museum and further research.The collection contains more than 5000 pieces which originate from the period between 2000 BC to 1550 AD. Mi Museo is located in the historical center of oldest Colonial city on the continent, Granada , in a building of 1700m2 dating from 1868. The building was restored with attention to its original design and preserving as many of the original rooms as possible. 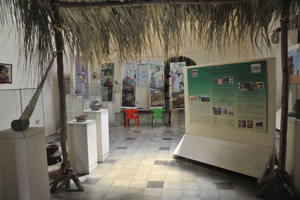  To promote the importance of conserving and protecting archaeological treasures and cultural artifacts from Nicaragua .  To promote archaeological and historical research.  To welcome, at no cost, all visitors who are interested in the appreciation of cultural material from the indigeonous societies of Nicaragua. The Granada Collection was established by Peder Kolind with the intention of preserving the cultural heritage that lies at the source of what it means to be Nicaraguan. The museum was opened in December 2005.